For the second consecutive year, the Mauritius Post released a Special Commemorative Cover to mark the International Customs Day, commemorated every 26th January. 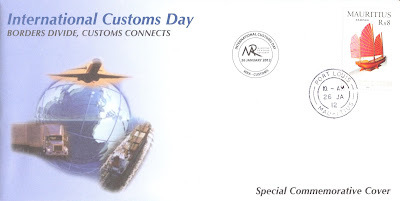 The theme chosen this year by the World Customs Organisation (WCO) is "Borders divide, Customs connect". Connectivity is high on the agenda of the WCO as the concept is critical for facilitating the movement of legitimate goods and persons across borders. The ultimate aim is to move towards a Globally Networked Customs (GNC) where the export declaration in a country becomes the import declaration in the receiving country. This is the vision of a future Customs community - free exchange of information, not only for traded goods but also on intelligence and risk management. The WCO has developed conventions, declarations and recommendations to facilitate connectivity, including Dta Model, Global Customs Network, n-CEN, CENCOMM, Mutual Administrative Cooperation and model Customs legislation. The Mauritius Revenue Authority (MRA) has been chosen by the WCO to pilot the n-CEN and by the IATA to pilot the e-freight. These projects are in the implementation process. Based on the Mauritian experience, these projects would be rolled out to other administrations. Cover illustration: "Borders divide, Customs connect"